We didn’t think that today’s walk would be that long, so it was nice to sleep in and then get coffee and orange juice (Mikey’s ideal Camino breakfast) in town before heading out. The village was quite beautiful in the morning light and we really wanted to stay longer. 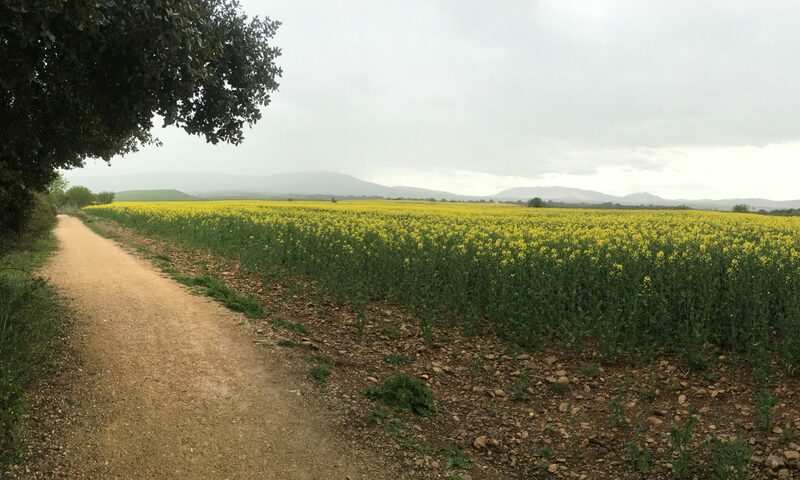 But, we had seen most of what we wanted and the Camino has a way of convincing us to continue with the promise of that which lies just over the next hill. Following an initial roadway stretch to exit the town, we entered a wooded area and walked alongside a river for awhile. OK, so not everyone is a morning … er, cow? We really didn’t mean to interrupt her breakfast, but this gal really knew how to stare us down. This region is also noted for its rivers and mountain streams which are fed by springs and swell during the annual snowmelt. Yep – we’re here just in time for that. What wasn’t cool was the closure of the Camino path due to railway construction. Yes, we are happy that Spain is expanding its network, but this has the effect of pulling pilgrims from the soft forest trails and depositing them on the less forgiving highway shoulders. Oh, and just zoom in on all the requirements for entering the construction zone. It almost makes us want to trespass. We’re still not exactly sure about which this sign is warning us. It could be high winds or the unusually large (and potentially threatening) number of windsocks in the area. Next up, we got to walk through a mountain tunnel. Luckily, we had a pedestrian sidewalk for this feat. It was rather narrow in the tunnel. And the exit postings were a bit unnerving as we walked further into it. What’s that bit about airplane exits and how you should look around as there might be a closer one just behind you? Yeah, you’re right, nobody really listens to that spiel. But … talk about not paying attention. After clearing the tunnel we decided to grab a small bite to eat at a truck-stop. Mikey asked if they had sandwiches or anything like that. The attendant pointed to a menu on the side of a napkin holder and “hamburger” stood out. Well, this is what arrived sometime later. Sure enough, there’s a hamburger patty in there, but it’s accompanied by fries, a salad, two hot dogs, a fried egg, some bacon, and a basket of bread. Good thing we’re walking across Spain! Following our unexpectedly filling lunch, we were back on the road with many miles left to traverse. This bit was less busy, but there were plenty of large construction vehicles trying to navigate some rather sharp turns. We were happy to finally rejoin the Camino trail and both ascend and descend the many switchbacks through a somewhat mountainous bit. It clearly wasn’t deep enough, but we soon found a river that the Camino followed for a bit. Mikey swears that we’re going to stop and swim at some point, but what we thought would be a mere 5-hour hike turned out to be closer to 8 hours. Ergo, we were thankful to finally reach the town of Lubián. In pride of place (as usual) was a handsome, yet simple, country church. But, unlike most village churches we’ve encountered, its doors were wide open and sacred music flowed outwards. It was quite refreshing to sit inside a most simple place of worship and enjoy its absence of frills. Later, while buying nectarines (oh, it’s practically the same word in Spanish – btw), we ran into a couple of Canadians with whom we had previously walked. It was really nice catching up with them over dinner. Although we probably won’t keep the same pace, Mikey is hopeful that our paths will cross again along the way. Morning comes early, dear reader. Buenas noches from yet another tiny blip on the map.